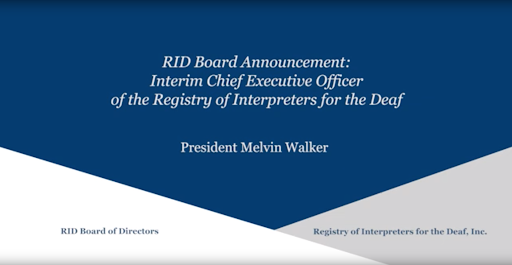 VIDEO DESCRIPTION: OPEN SLIDE IS BLUE AND WHITE AND GRAY WITH TEXT “MESSAGE FROM THE RID BOARD OF DIRECTORS MELVIN WALKER PRESIDENT”. BOTTOM LEFT CORNER TEXT RID BOARD OF DIRECTORS. BOTTOM RIGHT HAND CORNER TEXT REGISTRY OF INTERPRETERS FOR THE DEAF. SLIDE FADES TO MELVIN WALKER, WHITE MALE STANDING IN RED SHIRT WITH TAN BACKGROUND SIGNING. THE ENTIRE VIDEO IS IN COLOR. VIDEO FINISHES AND FADES TO BLUE, WHITE, GRAY SLIDE WITH FACEBOOK, INSTAGRAM, AND TWITTER TEXT AND ICONS. BOTTOM LEFT TEXT #WEARERID. BOTTOM RIGHT TEXT RID LOGO. 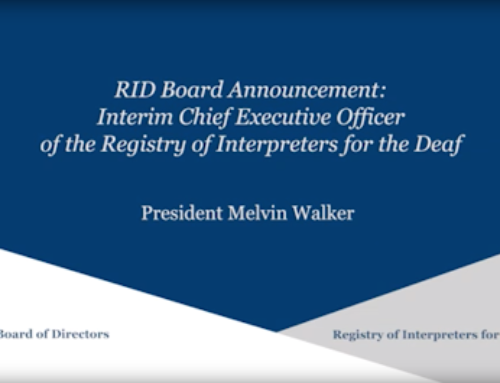 Hello, I’m Melvin Walker, President of the RID Board of Directors. 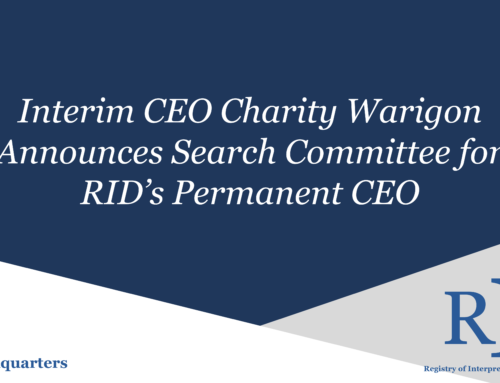 I’m communicating today on behalf of the Board to inform the membership that our CEO, Mr. Joey Trapani, will end his tenure with RID on September 30, 2018. 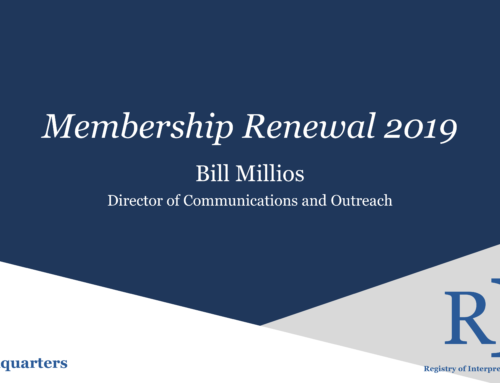 We want to thank him for his leadership during his brief time with RID, and we wish him well in his future endeavors. 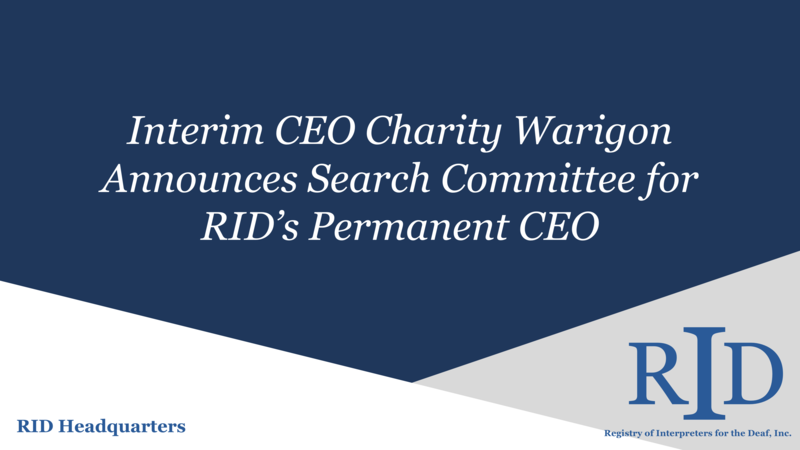 The work of RID will continue under the leadership of our current Chief Operating Officer at Headquarters, Mr. Elijah Sow. 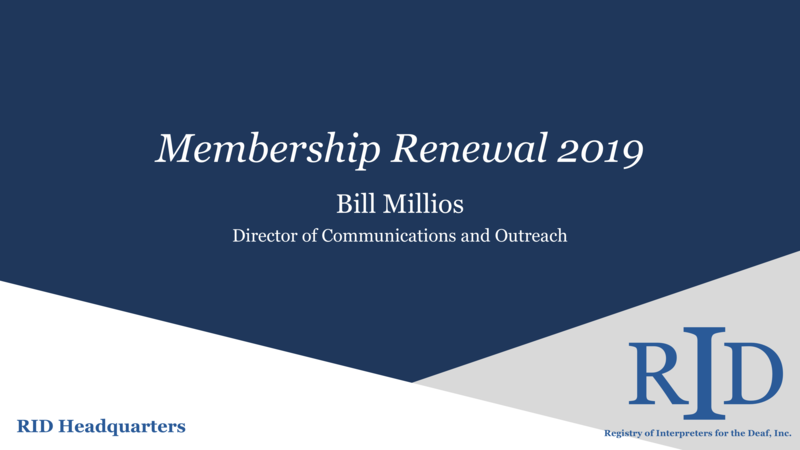 He will work with the Board on an ongoing basis. 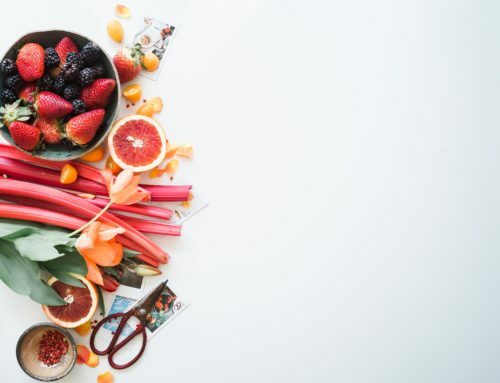 The RID Board will meet soon to discuss our future plans- and we will share updates about the plans for RID through vlogs and emails. I want to thank you all for your involvement in RID, and I look forward to your continued involvement in the future. Thank you!